LandShape passionately believes that sustainability should underlie everything which we, as humans, do on planet Earth. LandShape believes that sustainability should be paramount to landscape design, informing and shaping designs of all scales and situations, from rural national parks to inner city gardens. LandShape promotes all aspects of sustainability within landscape design and construction, from simple measures such as the provision of green and living roofs in garden structures to large scale ecological improvements. LandShape works with ecologists and arboriculturalists to provide design solutions which respond best to the natural environment in which they sit. 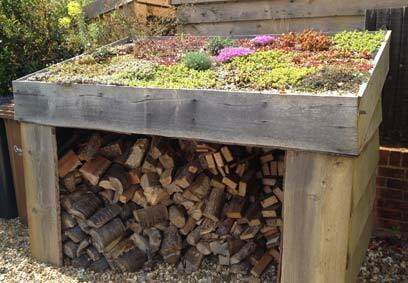 Small scale sustainable solutions in garden design: a living roof to a simple garden wood store provides habitats and food for insects and birds, and looks good too!